We are delighted to get the chance to put some questions to legendary book jacket artist, Bill Botten. Bill’s work has adorned hundred’s of famous author’s novels including Kingsley and Martin Amis, Ian McEwan, William Plomer, Salman Rushdie, Kurt Vonnegut, Michael Crichton and J.G. Ballard. For James Bond fans, Bill’s work is most recognizable from John Gardner’s Bond novels Icebreaker and For Special Services, as well as Christopher Wood’s Bond screenplay novelizations The Spy Who Loved Me and James Bond and Moonraker. 1. 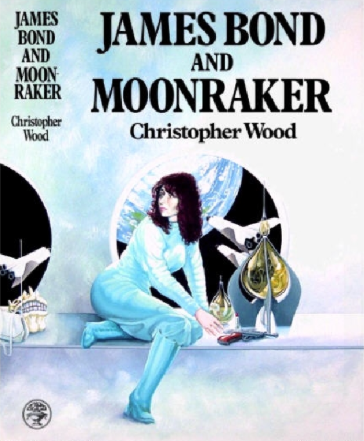 How did you become involved in the artwork for John Gardner’s ‘Icebreaker‘, ‘For Special Services‘ and Christopher Wood’s novelizations of ‘James Bond and Moonraker‘ and ‘The Spy Who Loved Me‘? I did a lot of work for Jonathan Cape and became involved when they had a falling out with Chopping. I was given free rein and went over the top. A moment of madness (three weeks actually) in which I produced a 2ft x 3ft painting in oil, something I had never done before or since for a book jacket. This was for The Spy Who Loved Me. The expressions on the faces of the Cape staff is something I will not forget. 2. What was your process for creating them and what medium did you paint in? The cover images were prompted by the books themselves. As I have noted, one was painted in oil and the other three in gouache. 3. On the For Special Services and Icebreaker covers, particularly the Icebreaker which is reminiscent of Chopping’s Thunderball cover. Was this an homage to that one, either intentionally or unintentionally? For ‘Special Sevices’ and Icebreaker’ I was asked to produce something reminiscent of Chopping but not really a homage. I did read the books (something I always did before approaching a cover) and this was the only time that Jonathan Cape gave an indication of what they would like. For all the other books I did for them they left the design entirely to me, in fact I never gave them roughs of the jackets, just presented them with the artwork. When I think about that now I find it quite astonishing. 4. What advice do you have for aspiring book jacket artists? My book cover days were before the advent of computers. I was very lucky in that Capes saw me as their problem book artist and put a lot of work my way. I would not have survived in book jackets otherwise because I did not have a particular style which made it impossible to market me. So I guess my advice would be to create a style all your own and find a good agent online or in reality. My concern is that original art is not used on jackets nearly as much as in the past. Bill is in the process of putting a book together describing how it was before the arrival of computers. Along with many of his covers and descriptions he talks of how and why he painted them. He aims to publish the book in time for his 80th birthday next year. The working title is “Bill Botten Uncovered“. ← James Bond MP3 Audiobooks Finally Arrive in the US!